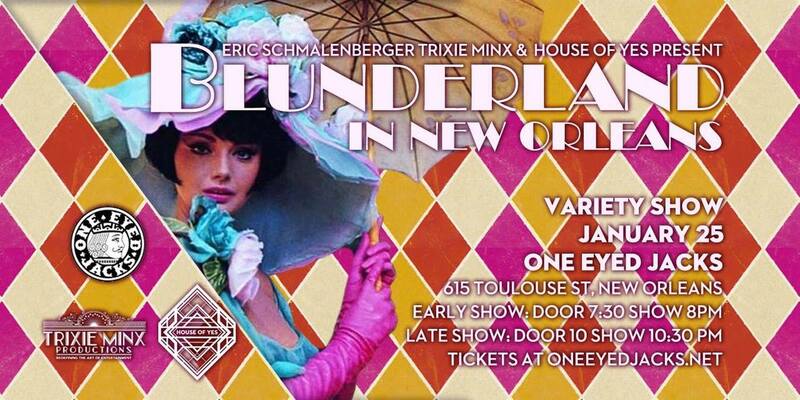 BLUNDERLAND, the extravagant burlesque show, will be returning to One Eyed Jacks in 2019 for another evening of whimsical, psychedelic, titillating fun. With the talents of Eric Schmalenberger, Trixie Minx, House of YES, and more, the show is certain to be a surprise for the audience. BLUNDERLAND draws from the best burlesque, circus, cabaret, and queer scenes for a hand picked, fresh, and special experience. The show urges you to leave behind all expectations and inhibitions. Come prepared for anything. BLUNDERLAND was stationed in Brooklyn, New York for three years, but returned to the south this past year to bring its unique magic to New Orleans. Including both local talent and favorites from the New York family, the show will have Kat Cunning, Darrell Thorne, Lune Noirr, Hybrid Movment Collectie, Adrian Claveria, Darlinda Just Darlinda, and others performing. These wonder people are ready to wow. The show will be on Friday (Jan. 25) with shows at 8pm and 10:30pm at One Eyed Jacks in the French Quarter. VIP table seating is $30, reserved seating is $20, and general admission is $15.